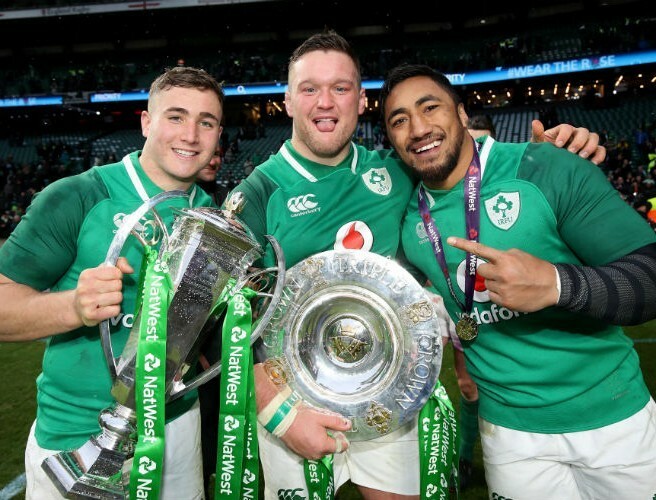 Jordan Larmour signed his first senior professional contract with Leinster Rugby at the end of January and less than two months later he was coming on to the pitch at Twickenham to help Ireland beat England to claim the Grand Slam. Before his Six Nations debut as a replacement on the wing against Italy, he had been deployed mainly at full back or out wide for Leinster but he slotted in seamlessly beside provincial team-mate Garry Ringrose when his centre partner Bundee Aki was forced off with a head injury on St Patrick's Day. "Jordan just wants to play," commented Leo Cullen whose well aware of Larmour's versatility. "I’ve seen him play all across the back-line. He started off in pre-season, he played a bit of fifteen for us. Then he actually played in the centre as well, in one of the games. He started the first PRO14 game against Dragons away on the wing, and then played a bit of fifteen as well and obviously shifted into the centre for Ireland and played on the wing. He’s incredibly versatile but he’s a very instinctive footballer as well." Cullen credits Larmour’s work ethic for getting him this far and has a wry smile when he recalls the list of goals which the player himself spoke about today. “I wouldn’t have believed you, that’s for sure,” Larmour admits when asked if he saw himself contributing to a Grand Slam win with Ireland. “It’s been a mad year so far. I sat down at the start of the year, just writing out my goals and [they were] to start for the Leinster ‘A’ team and maybe get a few caps for Leinster in the PRO14. Fast forward a few months and I’m part of the Grand Slam winning team. It’s crazy to think about it but I’m just loving it at the moment." As 2017 came to an end and following some eye-catching PRO14 performances and scintillating tries there were calls from ex-players and the media alike for the 20-year-old to be included in the Irish Six Nations squad but did he ever sense he would make the cut or had head coach Joe Schmidt dropped any hints? Larmour knows he still has much to learn and he before leaving camp he took some pointers from Schmidt and his international defence coach Andy Farrell which he will work on but he also gave some insight as to what the two coaches wanted from him when he came on in the England game. "If you’re coming off the bench, just fit in first. Don’t do anything too crazy. Just do the basics well. And when I came on, having Garry Ringrose inside me [was] a big help. He’s just so calm and it’s infectious. Everyone is just calm and knows their role and the clarity is very good. So when you come on you’re just ready to go. You’re prepared throughout the week so you’re ready to go on when you’re called upon." Larmour was speaking in Donnybrook this afternoon where Leinster Rugby and Energia announced a ten year naming rights partnership. The new deal will see Donnybrook Stadium renamed Energia Park.